To be brutally honest, a single day in Dublin is not a lot of time to work with. You will be on a tight schedule if you want to make the most of it. Thankfully, Ireland's capital has short distances and a relatively small central area. It is possible to explore the heritage sites and the new city in just a day, provided you manage to get up early and are willing to forsake the plan of seeing everything. Actually, we'd advise you to skip some major attractions (which will make it budget-friendly as well). Let us reiterate the most important point: get up early! If you are still lingering over breakfast at ten in the morning, you've already wasted valuable time. Hit the ground of central Dublin (namely O'Connell Street) no later than 9 am, fuelled and running. The nearer to the city center your accommodation is, the easier this becomes and well worth splashing out a few extra Euros for. Try to be on one of the first buses leaving O'Connell Street for the Hop-On-Hop-Off Tour and get a big slice of Dublin without any effort. The buses will take you past the major sights and, depending on which tour you choose (grab some leaflets the evening before or do some research on the internet), even far-flung attractions like the Guinness Brewery, Kilmainham Gaol, and Phoenix Park will be seen. The main thing to remember here: get a good seat on top, enjoy the view, listen to the commentary, and snap away... but do not get off the bus. This is your city tour. This will count as "having seen everything". The whole tour will last between ninety minutes and two hours, depending on traffic, so by late morning, you'll be back on O'Connell Street. Get off the bus in O'Connell Street, walk straight south and cross the Liffey on O'Connell Bridge. Follow the main road and this brings you to College Green, where you will already have passed Trinity College on the bus and maybe wondered what all the fuss is about. On foot, you can now enter the actual college area and get a feeling for this venerable institution. Now you will also see the Campanile, one of Dublin's most photographed buildings. Resist the temptation (should you feel it) to queue for a look at the Book of Kells. Even on good days you will lose time, see only a small portion and may come away slightly disappointed. The Old Library and the Book of Kells are for those visitors with more time, seriously. 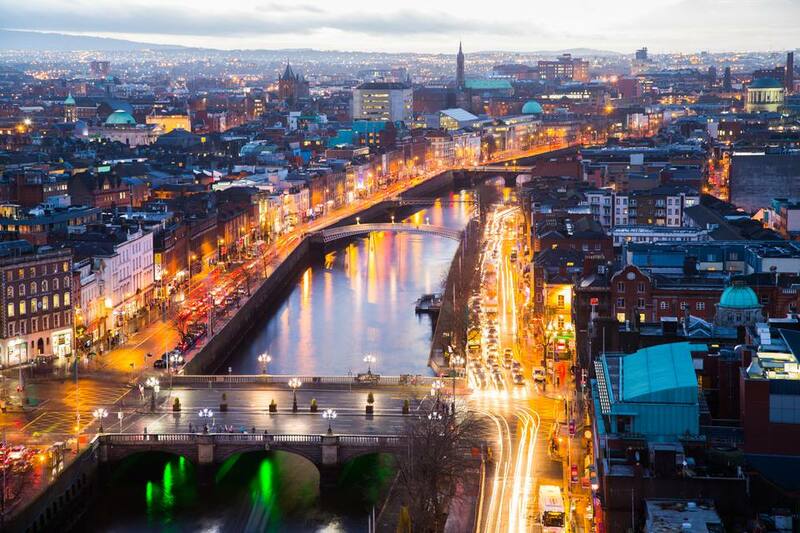 Instead carry on through Grafton Street, Dublin's posh shopping area, and up to Saint Stephen's Green. Either grab a bite on the way and enjoy it al fresco, or head straight on to The National Museum in Kildare Street. This is, in our opinion, the one museum no visitor to Dublin should miss. The National Museum of Ireland in Kildare Street showcases the history of Ireland up to and including the Middle Ages and will leave you impressed. Plan at least an hour, better ninety minutes or two hours, for a stroll around the two levels and an immersion into Ireland's past at its best. If you want to skip some exhibition areas, make sure to see the Celtic hoards, the early Christian treasures, the Viking remnants, and the bog bodies in the "Sacrifice and Kingship" section, like Clonycavan Man. The museum also has a very good restaurant, so you might take your lunch here. The gift shop in the entrance area might be a good opportunity to get some decent souvenirs. One word of warning, though: the National Museums are closed on Mondays, even if they are Bank Holidays. Slightly ridiculous, but an annoying fact. It is time again for a walk. Make your way back down Grafton Street to College Green, turn left and follow Dame Street to Dublin Castle. Again, the bus tour might have left you a bit underwhelmed here, so enter through the castle gates and be astonished. A walk around the area should take you half an hour, leaving you a bit of time to enjoy a coffee (both the café near the castle entrance and the Silk Road Café come recommended). Feeling a bit let down because you did not see the Book of Kells? Then pay a short visit to the Chester Beatty Library, which not only holds one of the oldest Bible fragments but also loads of simply stunning artworks and books. Or, explore the City Hall just outside the castle gates, another splendid building (though the exhibition in the basement may be skipped). By now, the attractions will be winding down, traffic will become nightmarish and you may feel a bit peckish. Good news: many restaurants in the city center open around 5 pm and offer “Early Bird Menus”. In this case, the early bird does not get the worm, but a bargain. Have a meal and think about what you want to do next. Depending on your tastes, an evening in Dublin can become very cultured very boisterous (or both combined). The main theaters and venues in the city nearly always offer a selection of shows, plays, and concerts for all tastes. Again, you will have done your homework and booked something in advance, we hope (though there always is a chance to get late tickets even for the Abbey Theatre, with a bit of luck). If you are set on enjoying an Irish night out, a large number of pubs offer their services and many also provide entertainment (free or for a small fee in most cases). Just follow the crowds, which will, more than likely, bring you to the Temple Bar area. Watch your wallet! There you go! Dublin in one day. You can fly off tomorrow—unless you've overdone the entertainment bit.